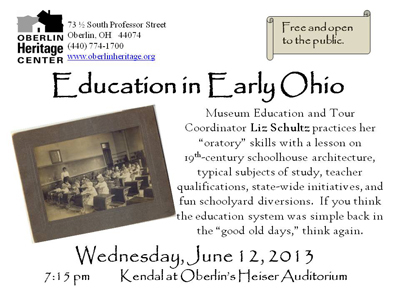 June 12 (Wednesday, 7:15 p.m.) Education in Early Ohio. Do you remember the word that knocked you out of a childhood spelling bee? James Fairchild, third president of Oberlin College, still remembered decades later (millinery). Hear some of his school reminiscences and those of other Oberlinians and Ohioans in this fun program that spans the early 1800s to the early 1900s. Museum Education and Tour Coordinator Liz Schultz will practice her "oratory" skills as she gives the audience a lesson on schoolhouse architecture, typical subjects, teacher qualifications, state-wide initiatives, and schoolyard diversions. If you think the education system was simple back in the "good old days," think again. Location: Kendal at Oberlin's Heiser Auditorium.